ImiLoa was kind of famous here in the PNW back in the old days. First, let me explain who Larry Christensen is. Back in the 60s he designed and built a 37′ trimaran that was years ahead of it’s time. Invictius had a huge dagger board, was wide, and had big amas way out there. And it was rigged to excel upwind, for its time. Unlike the famous Atlantic ocean trimaran designers who were using 3 strand halyards and had huge forestay sag, back then. Larry basically schooled a whole generation of builders and sailors here in the PNW, including me. And he did every race he could, including a couple of Transpacs. Am doing this from memory. Anyone actually knows more, do share. So ImiLoa came to the PNW to do the Swiftsure. They were bragging that they were going to clean everybody’s clock, including Larrys. “Wait,” Larry said, ” You are telling me that you don’t have boards on that boat?” “No.” “You won’t even finish on the same day that I do.” They didn’t. I see on the specifications and the boat, that it has boards now. Larry must have taken them to school also. Does anyone recall what year that was? What is a 50+ year old cat worth? My father bought IMUA! in ’77or ’78 for 12,000. I think we sold it for 6,000 in ’84. I saw it listed for sale in Florida (have no clue how it got there) in 2012 for $16,000 OBO. IMI-LOA , my guess sold 25-30k cash. I sailed on Invictus many times but was not involved with design nor build. I’ll politely state this story is ‘inaccurate’. Imi Loa NEVER traveled to the Pacific Northwest….ever. It’s primary owner (40+ years was Dr Vic Stern (R.I.P.) who kept the boat in Alamitos Bay (Long Beach) its entire life, parked front & center at the base of gangway 3, Slip #1. 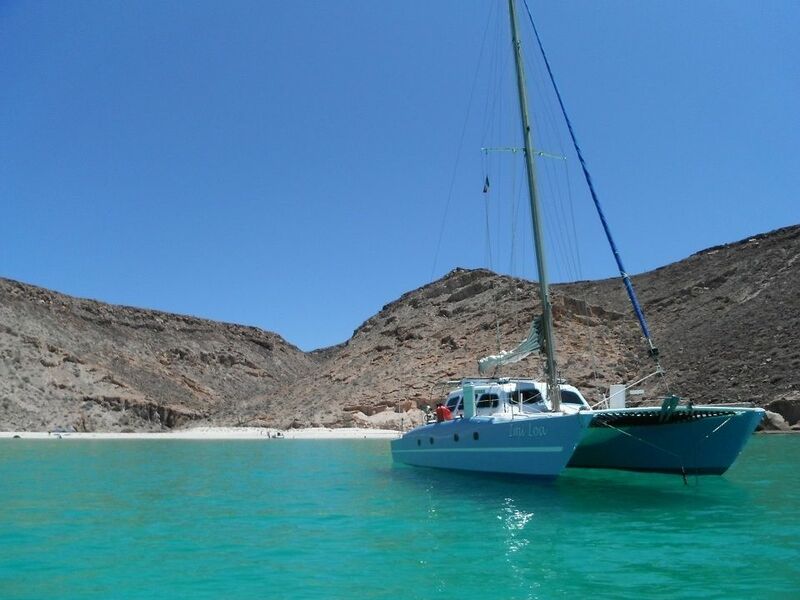 The 2nd owner, ‘Doc’ took it to Catalina Island for a while….before disappearing South with it as you see in the photo above (I believe the Sea of Cortez (Baja California). Vic did a lot of SoCal (& Ensenada) coastal racing with the boat and a few Hawaii trips…but it never went to the PNW. Imi Loa also had various dagger boards, of some sort, from day 1. In a nutshell, it must have been another CSK catamaran… period. You can contact the original poster of the thread via private message for more info. You have to become a member first to send private messages. larry was pretty clear about that. maybe anyone else was doing swiftsure back then.